Austin Kleon blogged recently about trying to explain to his 5-year-old that artists — in this case, Kraftwerk — are no different from the rest of us, and that meeting them might not be as pleasing as one would think. Kleon quotes Wendell Berry, who wrote “I am a man as crude as any,” and admits that he, too, suffers from the human condition. Although he loves meeting his readers, Kleon says that in his books they are getting the best version of him. But in thinking about Kleon’s point, former New York Yankee Mickey Mantle came to mind. 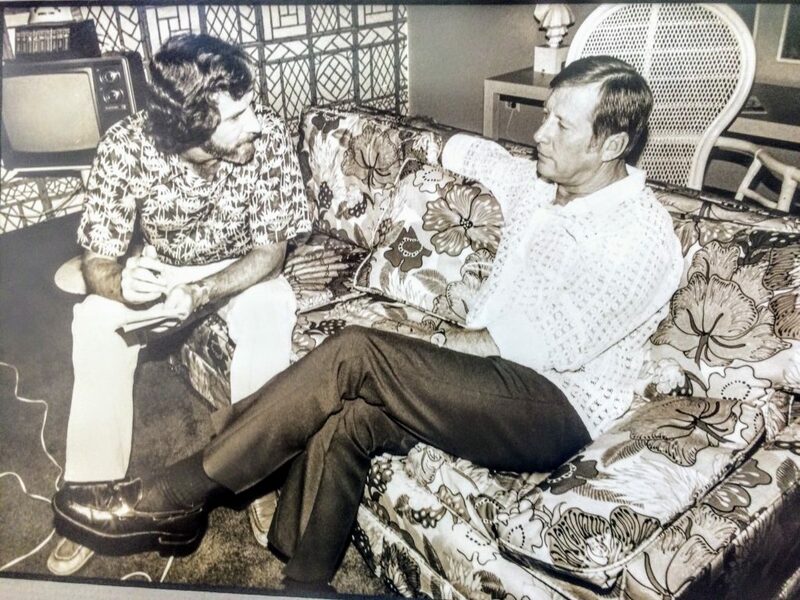 In early December of 1979, more than 10 years after he retired, Mantle and former teammate and best friend, Billy Martin, came to Honolulu to appear at a baseball camp put on by Pete Ward, a former teammate. They flew in from Dallas and did a late afternoon media interview at the Sheraton Waikiki Hotel. It was quickly apparent that “Open Jackson,” as Mantle called himself, and “Waco Texan” (Martin) hadn’t spent the 3,800-mile flight discussing Proust. They were slurring their words and kept up a line of banter that, as I wrote later, was “off-color, macho and chauvinistic” in an old-school, male-bonding kind of way. Mantle and Martin played on a New York Yankees team that dominated baseball from the early 1950s into the mid-‘60s, and they did it at a time when New York was transforming itself into the Big Apple. It was the financial, media, entertainment, advertising and retail capital of the world, the home of the The Tonight Show, the Ed Sullivan Show, the Today Show and just about any other show of significance. It was the home turf of Frank Sinatra, martini in one hand, cigarette in the other. Bob Dylan was playing clubs in Greenwich Village; Thelonius Monk and Charlie Mingus played the Five Spot in the East Village; Leonard Bernstein had the New York Philharmonic; and uptown in Harlem, James Brown electrified the Apollo Theater. New York was full of itself, the city of winners, and it doted on the Yankees. Mantle was the best of them, a marvel of speed, power, and skill, a legend in the making, and in his off-hours, the carousing, hard-drinking, adulterous prince of the city. He could show up at Toots Shor’s any night of the week knowing he would never have to pay for a drink. When he arrived in Honolulu at 48, though, his skin was blotched and puffy, there were creases around his eyes and he was sadly overweight. But he was well-oiled that evening, a happy, high-functioning drunk, and he was obliging and responsive during the interview. Martin was, as well. I was the last media member to leave, and when we finished, the four of us — Mantle, Martin, Ward and I — left the suite together. The Sheraton Waikiki was — and, I assume, still is — shaped like an S, and we were walking down a hallway that curved to the left, unable to see more than about 30 feet ahead. I was to Mantle’s left. Martin and Ward were behind us, and I couldn’t help thinking how cool it was to be walking next to Mickey Mantle himself, even in his inebriated and shopworn condition. And that’s when he passed gas. As in farted. As in broke wind, a prodigious thunderclap so startling and violent that it volleyed off the walls like a sonic boom. Before anyone could react — in what would surely have been a “boys will be boys” fashion — our momentum carried us around the curve and face to face with two couples coming the other way. They were handsome senior citizens, white-haired Mainlanders decked out in polyester Hawaiian shirts and muumuus, enjoying their expensive and no doubt long-awaited Hawaiian vacation. But their eyebrows were up in their hairlines, and on their faces were expressions of shock, embarrassment and scalding, Old Testament disgust. It took me back to being 11 years old, and every fiber of my being wanted to point at Mantle and say, “He did it!” because in their eyes we were all guilty. I didn’t. I took one for The Mick that day, and when I wrote the story, I covered for him again. I informed the gentle readers of Honolulu that Mantle had belched, which wasn’t exactly putting a happy face on the event, but it was less objectionable. Any way you slice it, though, Mantle had shown that he could be “as crude as any man.” But the story continues. Cancer of the liver led to a transplant, but the cancer returned and Mantle died in August 1995 at the age of 63. Which makes me sad even all these years later. I wasn’t a Mantle fan growing up; my baseball allegiance was elsewhere. But I did admire him as a ballplayer, and I admire him even more as a human being for the way he rewrote the ending to his story. It took courage and humility to own the ugliness and dysfunction of his past, and the reward for his transformation wasn’t a standing ovation at Yankee Stadium, it was peace and self-respect, at last. This entry was posted in Uncategorized and tagged alcoholism, Austin Kleon, baseball, cancer, Kraftwerk, Mickey Mantle, transformation, Wendell Berry on June 29, 2018 by John Christensen.